People who suffered from foot pain years ago tried different kinds of home bunion treatment. 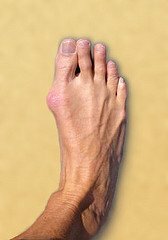 Bunion surgery ["bunionectomy"] is a common modern-day solution for bunion problems but these remedies predate the era when surgery was an option. Some home remedies for bunion treatment were foot soaks, foot exercises, and compression massage. The word bunion comes from the Greek word for "turnip. "The bulge of the bunion at the big toe joint does resemble the bulge in the center of the turnip. The pressure of wearing poor shoes or stockings over an extended period of time causes dislocation to the joint of the big toe, known as the metatarsophalangeal joint. The joint becomes irritated and inflamed, causing a bursitis-like inflammation to the membranous sac which secretes joint lubricating fluid in the big toe joint. The dislocated big toe joint is called "hallux valgus." Ladies who love your high heels, don't despair! You can get away with wearing high heels a few hours a day, as along as you also get plenty of walking in your bare feet at home. Just don't "live" in high heels for 12 to 18 hours a day. Give your feet plenty of exercise by walking barefoot as much as possible. At work, kick off your heels when sitting at your desk and curl and uncurl your toes and rotate your ankles in a circular motion. Get foot and leg massages too. Prepare a small tub or basin with cold water. For each pint of cold water mix in 3 tablespoons of Epsom salts. Soak a thick wad of cotton wool, or folded cotton cloth or flannel, in the water. Wring out cotton wad, wrap around the bunion, and cover snugly with a dry cotton wool or flannel sheet. Wear at night while sleeping. Repeat each night as desired. Exercise 1. Sit on a chair with feet raised up off the floor. Straighten legs out parallel to floor as well as possible, at same time curling your toes towards soles of feet. Repeat several times until tired. Do every day as much as possible. Exercise 2. Walk barefoot around a room using only the outer edges of feet, soles and heels not touching the floor. Do this daily as much as possible. Have compression massage performed on the soles and tops of the feet, and along the ankles and calf muscles. Ask an osteopath about adjusting the bones of the feet. The 20th century British osteopath Leslie O. Korth, author of Unusual Healing Techniques, recommended osteopathic foot manipulation to ease the strain and pain of bunions.